Attracting, managing, and developing the next generation of public relations leaders has emerged as a key challenge in the field. Though academic and trade scholarship addresses millennials in the general workplace, there is a relative dearth of information about millennials in public relations. This project offers a practical perspective of millennial professionals’ expectations of the field, and executives’ management techniques. 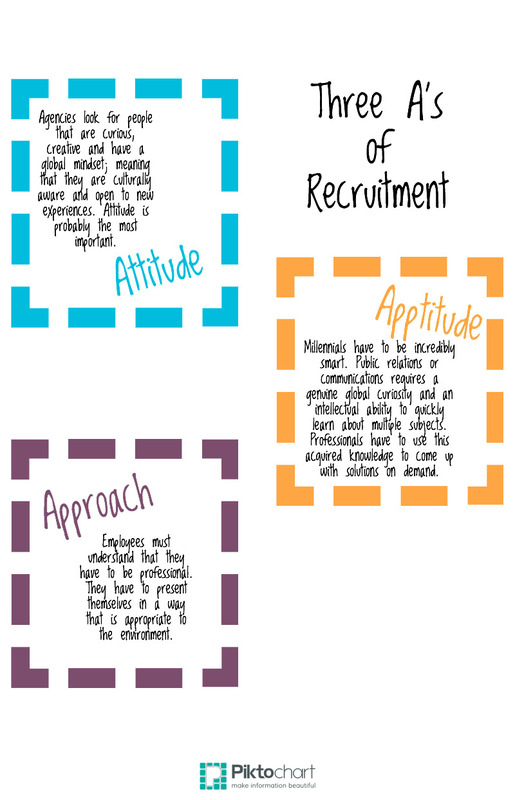 As the numbers and statistics show an increasingly-influential group in the workforce, recruitment, retention, engagement, and development of millennials become crucial to organizational success. Researchers, Dr. Juan Meng, Holley Reeves (doctoral candidate) and Dr. Bryan Reber, led two classes in the Grady College of Journalism and Mass Communication at the University of Georgia as students conducted at least one telephone or in-person interview of a public relations professional about the topics of millennial recruitment, retention, engagement, leadership development, and work-life balance. Senior-level undergraduate students interviewed millennial PR professionals, drawing from their professional and personal networks to find a varied list of interviewees. 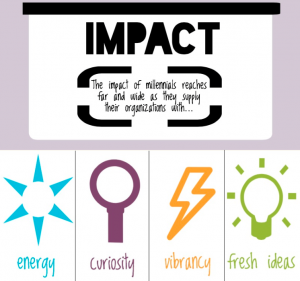 Master’s-level students interviewed PR executives who regularly manage millennials. The executive sample was drawn from professional and industry contacts of Grady faculty members. Each student transcribed, analyzed and summarized their interviews to create the “insights.” A total sample of 75 interviews was used for this study. Relationships – Millennial-supervisor mentorship programs develop millennials’ skills and channel their energy to best serve the organization, while providing the personal relationships that millennials crave. Honest and transparent relationships offer opportunities to set clear expectations, provide feedback, and teach millennials. Diversity – Millennials desire diversity in the ethnicity of colleagues, in daily work, and in the organization’s culture. Developing an adaptable culture that fosters diversity in ideas attracts top millennial talent and encourages retention within the company. 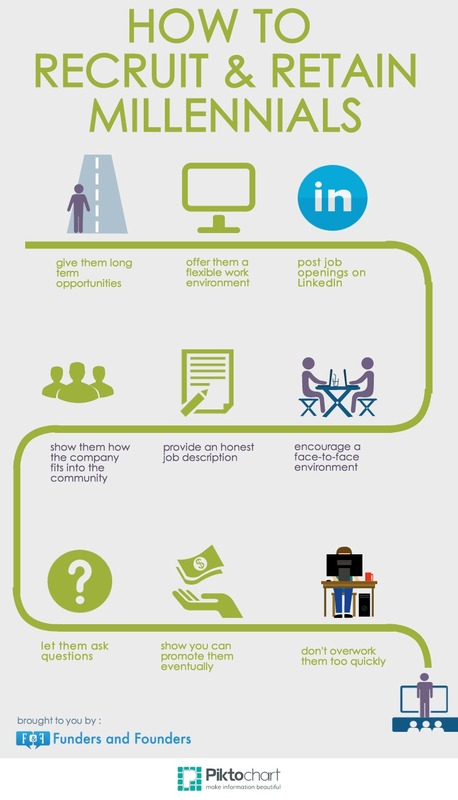 Development – Leadership development programs attract and promote top talent within the organization. 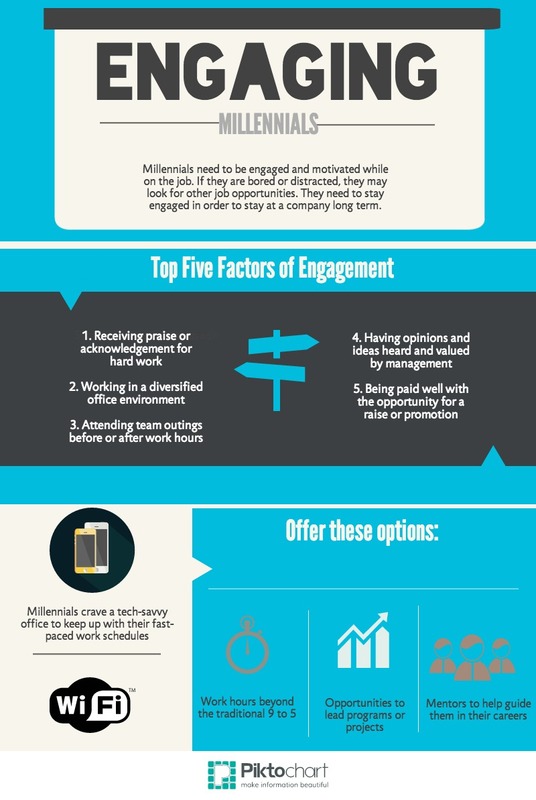 Millennials are ambitious and desire quick promotion. Executives suggest acknowledging millennials’ successes, offering educational and development opportunities, and clearly explaining promotion processes to engage millennials. Technology – Millennials are, in part, defined by their proficiency and reliance on technology, a feature also incorporated into their job search and careers. As organizations turn to digital communication to connect with consumers, executive identify success in similar techniques to recruit, retain, and engage talent. This area is also a source of significant millennial leadership within the industry as these digital natives bring their skills into public relations. Social responsibility – Growing up in an era of social responsibility, millennials seek a higher purpose in their work and look to give back to society. 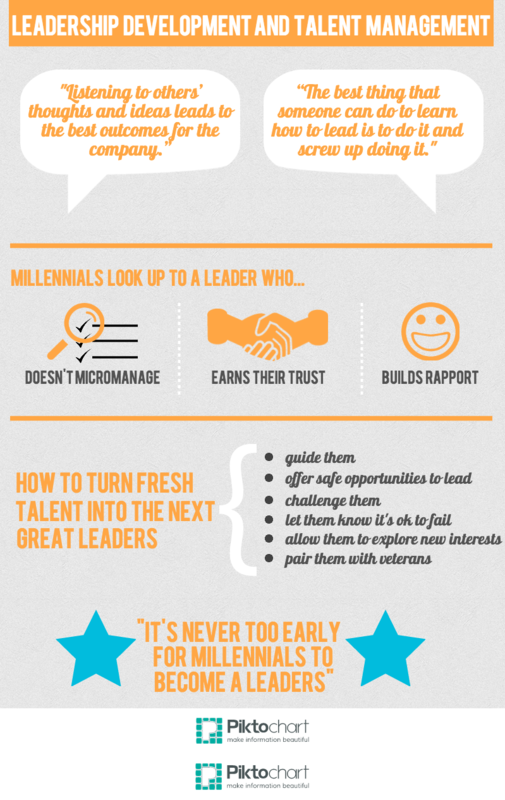 Opportunities to serve the community will attract millennials and encourage engagement with the organization. As organizations identify, acquire, and cultivate top talent, executives and millennials search for the balance between existing structures and changing institutions. PR agencies, departments and the industry are in a season of transition as the face of the workforce changes with the newest generation. Successful talent management techniques ease this process for new employees and existing organizations but require patience, flexibility, research, compromise, targeted messages, and open communication – in essence, public relations and communication management skills – to successfully navigate the change and incorporate the next generation of leaders.